Kraft Mac & Cheese Recall - Check Your Boxes! If you’ve got boxes of Kraft Mac & Cheese in your cupboard , get them out and check them for this recall. 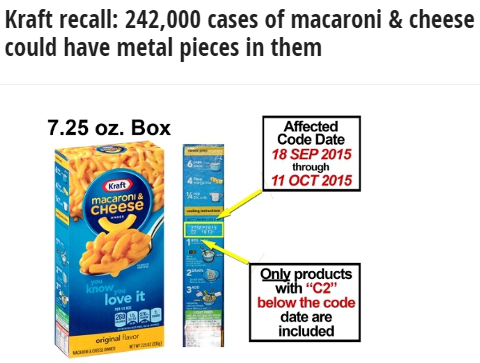 Kraft is recalling 242,000 cases of mac & cheese that may have metal pieces in them! The company recalled 7.25-ounce size boxes of Kraft original flavor macaroni & cheese with “best when used by” dates of Sept. 18, 2015, through Oct. 11, 2015, with “C2” directly below the date. The “C2” refers to the production line on which the affected products were made. If you have any of the recalled boxes return them for an exchange or a refund to the stores where you bought the items. You can also call Kraft consumer relations at 800-816-9432 from 9 a.m. to 6 p.m. Eastern time. You can read more about the recall HERE.